Garmin Astro 430/T 5 Dog Tracking Bundle Review: This helps you track your hound’s every move with great precision and accuracy. The device is simple to use. Just turn on the transmitter and the handheld and within seconds you will get the GPS signals from the satellite. Attach the collar to your dog and set him loose and start tracking. The Astro 430 is also one of the few handhelds on the market with a color display. The 2.6 inch display is scratch resistant. The build is sturdy and really is made for outdoor activity. You don’t have to worry about scratches and damage even if you place the device on the earth face down. The 240×160 pixel resolution TFT display is clear and easy to view even in bright lighting conditions. With a full charge, the device can easily last for a full day (24 hours). To make the most out of the battery, you can also set back light timeout so that the display doesn’t have to be on all the time. The battery is also removable, so if you happen to go camping in the woods for a couple of days, you can swap batteries. Also, you can easily charge them if your car / vehicle have a charging port. The device supports USB connectivity. You can hook it up to your computer and update downloaded map data. When you are not using the device for months, you can simply remove the battery and all your map data will be intact. The device also supports topographic maps which come with detailed terrain information. The transmitter is made up of polyurethane, which is known for its durability and toughness. The Garmin Astro 430/T 5 tracks the dogs’ position and indicates its position every 5 seconds. The all-weather collar, VHF antenna and state-of-the-art GPS receiver makes this one of the best tracking collar transmitters. This transmitter can track up to 20 dogs from a range of up to 9 miles. The device is so sophisticated yet very easy to use. The buttons are clearly marked and is pretty straightforward to use. Press the ‘Dog’ button and Dog Tracking Page will open showing the exact position of your dog along with the trail it has traversed. Press the ‘Mark’ button and the device will register your current location. The ‘In’ and ‘Out’ buttons will help you zoom in and out of the map seamlessly. There is also a big rocker on the center which helps you pan the map and to navigate through the options. Apart from tracking your hounds, the device also has other useful features like, a built-in calendar, stopwatch, calculator, and sunrise and sunset notification. If you want to kill some time, you can also play simple yet addictive games on the beautiful 2.6″ display. the tracker might be big for small breeds. 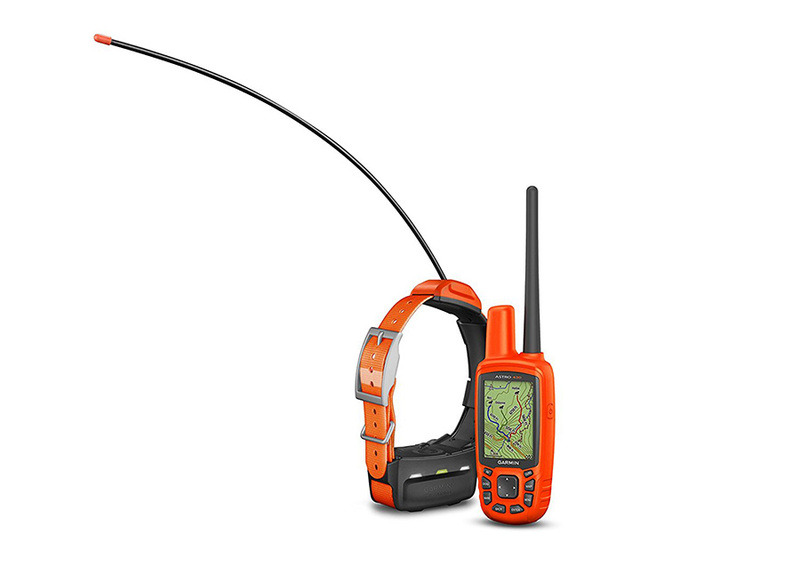 With a brilliant 2.6 display (sunlight readable) and easy to configure and use, the Garmin Astro 430/T 5 is definitely one of the best dog tracking GPS bundle currently available on the market. You don’t have to worry about losing your dog again with this powerful and accurate GPS dog tracking system.